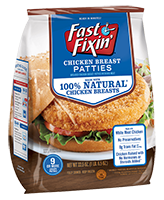 Fast Fixin' | Unbelievable Taste. Unbeatable Value. Unbeatable Value For You! Save $1 on Any Product. 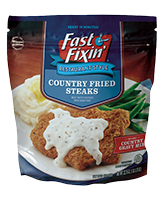 IT’S HARD TO BEAT FAST FIXIN’! With Fast Fixin’ you get great taste and a great value. Our family of tasty, satisfying, easy-to-prepare frozen chicken and steak entrées are great on their own or as part of a recipe. One taste and you’ll see why kids love our unbelievable taste, and moms love our unbeatable value. Moms love the flexibility and ease of preparing a meal that they know the whole family will enjoy at a price that’s easy on the wallet. 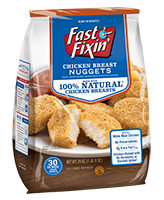 Our 100% all-natural* Chicken Breast Nuggets made with chicken raised with no hormones or steroids added** beat the competition in taste tests with some of the toughest customers – kids! It’s the crispy breading, firm bite and natural rotisserie flavor that our fans love, and the same attention to taste satisfaction goes for the rest of our delicious products. From easy, kid-friendly meals, like our fun-to-dunk Jumbo Popcorn Chicken or a dinner-sized helping of our Country Fried Steaks with Gravy, we’ve got the comfort foods you crave. To taste for yourself, grab your Fast Fixin' coupon and give our entrées a try for lunch, dinner…any time! A Product ofAdvancePierre Foods, Inc.